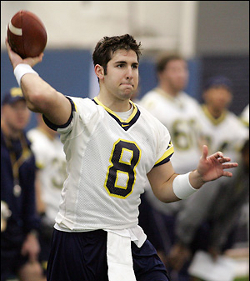 After the transition from Lloyd Carr to Rich Rodriguez took place, Michigan lost its starting quarterback in Ryan Mallett and was stuck with the platoon of Nick Sheridan and Stephen Threet. The dearth of talent was understandable: Rodriguez brought with him a completely different style that didn't fit the players Carr had recruited. But the fact that Penn State, with the longest reigning head coach in the history of college football is facing this kind of quarterback crisis is incomprehensible. 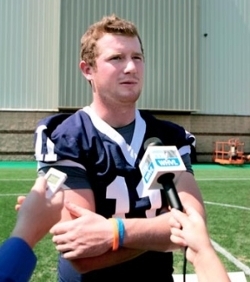 Tomorrow, PSU will start a redshirt sophomore walk-on at quarterback. Despite the program's longevity and stability, Nick Sheridan will be starting for Penn State. Not exactly the kind of numbers you'd expect from PSU, especially after the last three years of relative dominance alongside Ohio State in the Big Ten. PSU's offensive numbers are atrocious. Not only has the passing game being non-existent (true freshman QB Robert Bolden has been exactly that: a true freshman), but Evan Royster is averaging less than 70 yards per game. This is not the Penn State you know. PSU's defense isn't even the dominating unit that they have been in years past. But at least there's an explanation for that: PSU has been hit as hard, if not harder, than any program in the country by injuries. Not only should Michigan be able to stop PSU's inept offense, but the thin, injured defense of PSU should be porous, enabling Denard Robinson to return to the form we saw earlier in the year. Again: This is not the Penn State you know. This is, no questions asked, a must-win game for Michigan and Rich Rodriguez. Penn State's defense isn't very good and their offense may be the worst in the Big Ten. If PSU is able to put up the 500 yards and 24+ points that seemingly everyone can against Michigan, Rodriguez's job is in serious jeopardy. Penn State's offense is essentially Michigan's defense, except PSU is starting a sophomore walk-on quarterback, who has never started a game and has thrown 15 passes in his collegiate career. Michigan will completely shut down PSU's offense, generate a few turnovers, and show very few new defensive looks. With McGloin's inexperience and PSU's lackluster team, Greg Robinson will not waste new, effective defensive fronts against a team that Michigan should be able to shut down. Any time Michigan gets a negative play (sack or penalty), expect them to get the ball back. PSU lacks the talent at quarterback to convert 3rd and long, and their run offense isn't strong enough to carry the team out of long-yardage situations. With a weak offensive line, look for Mike Martin to do a lot of damage and get to McGloin at least once. Otherwise, Michigan will probably bring more pressure than they have earlier in the year. Getting to McGloin and not allowing him to sit in the pocket will drastically increase the chance of a bad throw that results in an incompletion or interception. Offensively, it's going to be much of the same. Michigan is going to primarily run at PSU's depleted defensive line and will do a lot of damage. Denard is probably going to break a few different runs of 20+ yards as he'll be able to get to the second level with relative ease. Expect Michigan's running backs to have a good day as well. With the bye week allowing Mike Shaw to get healthy again and, presumably, PSU forcing Denard to hand the ball of on the zone-read, Michigan should have an advantage anywhere they play. Expect Michigan to average 6.0 yards per carry against PSU. Through the air, Denard should have a bounceback game. After two shaky performances against MSU and Iowa, due at least in some part because of a sore shoulder that should be (mostly) healed after the week off, Denard will be able to find open receivers as PSU has to overcompensate for being gashed on the ground. Denard will finish the game without throwing a pick and will stop grounding a lot of those 7-yard hitch routes that he's been having trouble with the last two games. Before the game I expected the same result as you describe here. So, is there any possible explanation that we were both so wrong on every single prediction? And given that this was a "must-win game for Michigan and Rich Rodriquez," what does that mean for the rest of this season?